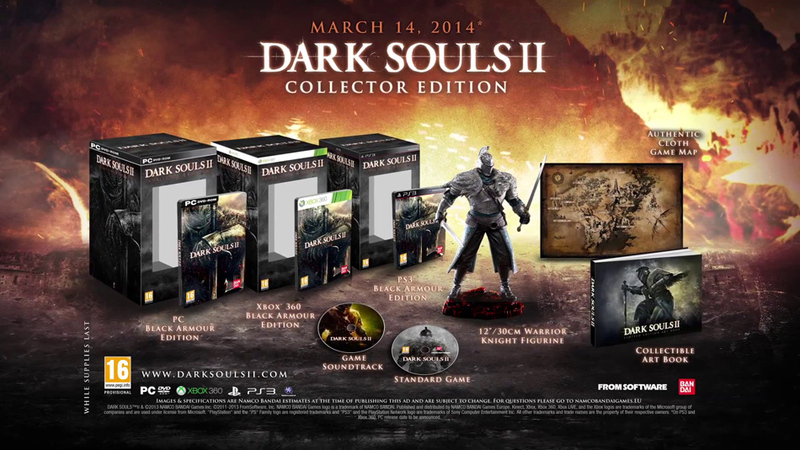 Namco Bandai have announced details on the Collector’s and Black Armour editions of Dark Souls II. The game will release on March 11 in America and March 14 in Europe and Australasia. “Avid videogame collectors and aficionados will want to immediately reserve their copy of the DARK SOULS II Collector’s Edition. The DARK SOULS II Collector’s Edition will feature a premium quality Warrior Knight figurine measuring in at 12 inches / 30 cm in height and weighing in at nearly 16 ounces / 450 grams. Fans will also be able to thumb through an exclusive hardbound art-book filled with never-before-seen images created by the talented artists at game developer FromSoftware. True adventure fans are sure to enjoy the sizable full-colour fabric map of the DARK SOULS II game world that can only be had within the Collector’s Edition. Topping off this extensive package is the metal game case from the DARK SOULS II Black Armour Edition which will contain both the game disc and the official game soundtrack composed by famed Japanese composer Motoi Sakuraba.